Superbright 3528 SMD, high intensity Ultraviolet Back Lights. Glue, and heat shrink protects your solder joints. Adhesive backing tape for secure and easy application to most surfaces. Ultra-bright but running at low temperature. Light up your car or home with the ultraviolet black lights to make florescent colors super bright while hiding dull color. Always use a fuse to protect from hazard. 1. Due to its wavelength is 395-405nm ,so we can see the color is bluish violet or blue by the naked eye rather than violet. In fact, its reflection is purple. 2. IP65: Super slim flexible PCB, with 3m tape. 3. It's 100% guaranteed UV Led blacklight.You can use a dollar to do a test and you'll find fluorescence. Waterproof & Safety: Waterproof Rating: IP 65, suitable for indoor/outdoor. The working voltage is low, 12V DC, running at low temperature. It is touchable and safe for children. LED Type: High Quality, intensity and reliability SMD 3528 LED, 300 leds, 60 leds/m, Super-Bright, wavelength is 395nm---405nm. Color: UV purple, without any UV FADE or Color Change problem, Long lifespan >50,000 hours. Cuttable & Flexible & Easy To Install: It can be cut every 3 LEDs along the cutting marks and it can be extended depending on your needs. Slim, compact and flexible light strip. 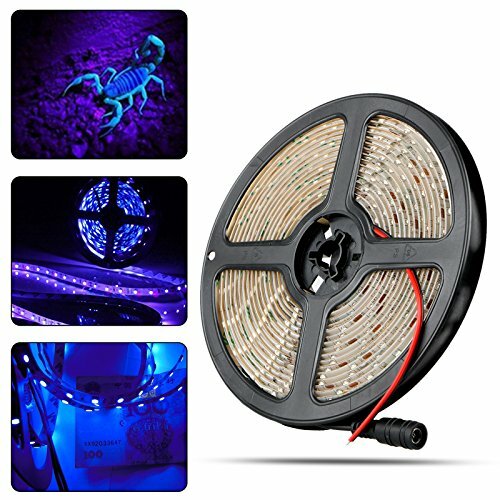 It is Ideal for home and business light decoration. Self-adhesive back with adhesive tape for secure and easy application. It widely works great on shop windows, home decoration use, hotels, clubs, shelf, garden, art lighting, architectural decorative lighting, boutique atmosphere lighting, holiday atmosphere lighting, etc. If you have any questions about this product by LinkStyle, contact us by completing and submitting the form below. If you are looking for a specif part number, please include it with your message.